Making jam is one of those things I always imagined was the preserve of rather matronly women out in somewhere-or-other-shire, involving vast amounts of fruit, painstaking measurements and an iron bottomed pot of practically medieval pedigree. Once these wise woman have assembled their hand picked fruit and paraphernalia I imagined they would proceed to boil the mixture at temperatures unheard of beyond the surface of the sun and with an attention to detail with regards to time as to make a particle physicist weep into his accelerator. So it was with no small measure of utter astonishment that I made fig jam earlier on in the week. It took me about half an hour and involved a bit of stirring and the ability to count to 6. Those country matrons have been having us on. I have to admit that I followed the simplest recipe I could find and hoped for the best. It was one of those lovely moments of kitchen alchemy, like whisking egg whites, making mayonnaise or watching jelly set in the fridge, where, if you ignore the current raft of kitchen science books, you can believe that there is still magic left in the world. The mashed up figs looked forlorn in the bottom of my biggest saucepan, they weren't exactly the most flawless examples of their kind, barely ripe and a bit on the meagre side. I had visions of ending up with some rather anaemic looking jam. However, once the jam sugar went in, the entire mixture turned a vermilion so shocking as to have me shouting out to the girlfriend to come and see, before remembering she wasn't actually in the house. Or even in the country. The jam is now nestling quietly in the larder, having filled every available empty jar I had been saving for no good reason rather than I thought I might do something with them in the end. They bring a smile to my face every time I open the door, all different sizes and shapes, all filled with that deep velvety red. It strikes me every time I take a peek, how something so simple and mundane can be quite so satisfying. Wonderful sentiment. For something truly unique, try a tomato-ginger jam. It's delicious (and tastes much better than it sounds). i made some pear and almond jam last night... can't wait to go home and bottle it up after work! That fig jam looks bloody marvellous. Beautiful shot! And about the astonishment, I can totally relate. Jam-making always looked so arcane - and then in despair over some expensive and tasteless figs I made jam for the first time. 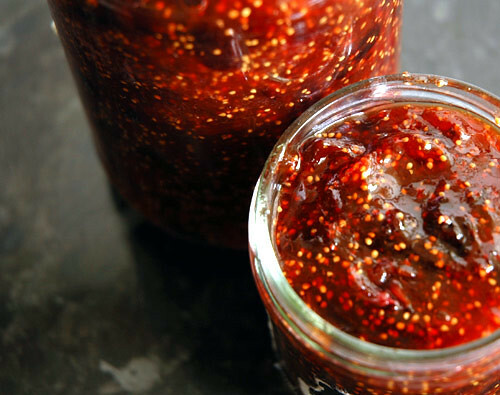 Fig jam is such a payoff, because it's so easy and it makes figs taste the way they should, to me.